President Donald Trump visits POET Biorefining – Gowrie in November 2015 during his presidential campaign. President Trump announced on Tuesday, Oct. 9, that he will allow year-round sales of E15, fulfilling a promise he made on the campaign trail to support ethanol and responding to the rally cry of farmers and ethanol producers across the country’s heartland amidst the nation’s farm crisis. Ethanol industry groups have been watching closely for an announcement since Trump had said in July that he was “very close” to lifting the ban. Outdated regulations from the Environmental Protection Agency (EPA) restrict sales of E15 — a federally approved biofuel with 15 percent ethanol and 85 percent gasoline — placing an unnecessary burden on fuel retailers and depriving American consumers of relief from higher gas prices. According to Politico, a White House official says the EPA hopes to have the E15 waiver in place before the start of the next summer driving season. Year-round sales of E15 are seen as an attractive homegrown solution to give an economic boost to Midwest communities hit hardest by the farm crisis. Nationwide adoption of E15 could drive demand for an additional 2 billion bushels of surplus grain annually and help protect countless rural jobs and family famers across America’s heartland. 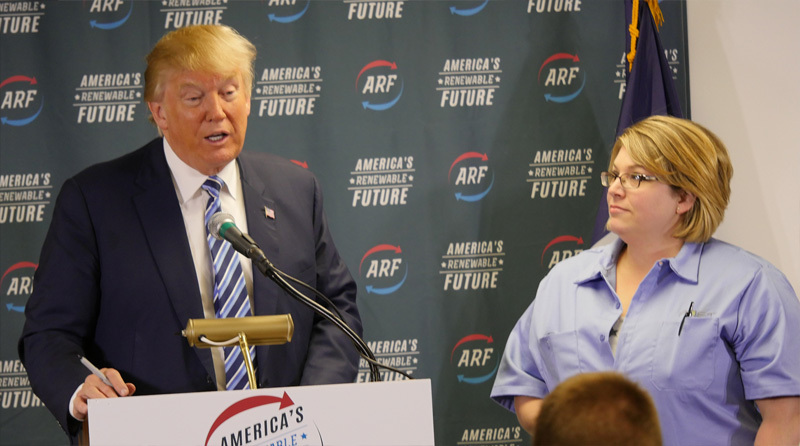 “I would like to thank President Trump, on behalf of our 2,000 employees and our 30,000 producers, for fulfilling his promise to the Midwest and our industry,” said Jeff Broin, Chairman and CEO, POET. “This is a historic directive — not only for our farmers, but for the nation as a whole. The move to E15 will provide consumers with the choice to fill up with low-cost, high-performance fuel year-round, while improving air quality in our country’s largest cities. Trump made the announcement Tuesday afternoon before leaving to attend a campaign rally in Council Bluffs, Iowa. He’ll be in the home district of GOP Rep. David Young, who is up for re-election in November. The timing of Trump’s announcement is widely seen as a play to help aid Republications like Rep. Young in midterm elections across the farm belt who will need farmer support in order to win. The biofuels industry has long advocated for a lift on the ban because of the benefits E15 holds for the environment, the economy and consumers. It’s what many refer to as the “win-win-win” of E15. E15 is approved for use in 9 out of 10 cars on the road today and is the fuel of choice for professional motor sports, including NASCAR. On average, consumers can save up to 10 cents per gallon when filling up with E15. Trump is also directing the EPA to place restrictions on trading biofuel credits, according to the White House official, to address oil refiners’ concerns. POET PAC: How do PAC dollars work? POET PAC is a non-connected Federal Political Action Committee (PAC) formed in 2008 to give our industry and rural America a voice in Washington D.C.